This is my Holy Grail, I would like to thank the members that had the parts that i needed to build my dream. I have built this the way I would have had it B.I.T.D. so if the purists hate it I don't care because there are plenty of era correct RL20-IIs to be seen. I will be listing parts rundown later, hope anyone checking it out likes what I have done. Powder coated by Chip @ C4 Labs, AJK 86 decal kit, N.O.S. ACS Pro Rotor, N.O.S Dia-Compe 880 chrome front and silver 990 rear, ACS 45 stem. Redline dual pinch 180mm Flights, Polished bubble font 43 tooth Redline chain wheel, Odi longneck grips, Dia-Compe tech77 levers, Peregrine seatpost clamp, Redline seat post, Dominator seat (copy) Panaracer copys, Handmade Forklifter numberplate. I would like to say thanks to RL-20IIGuy,Deli_Mas,OrangeCobraRob,b_koenig,hboost,91gt347, & ZRims1 for having the parts I needed to build my grail. 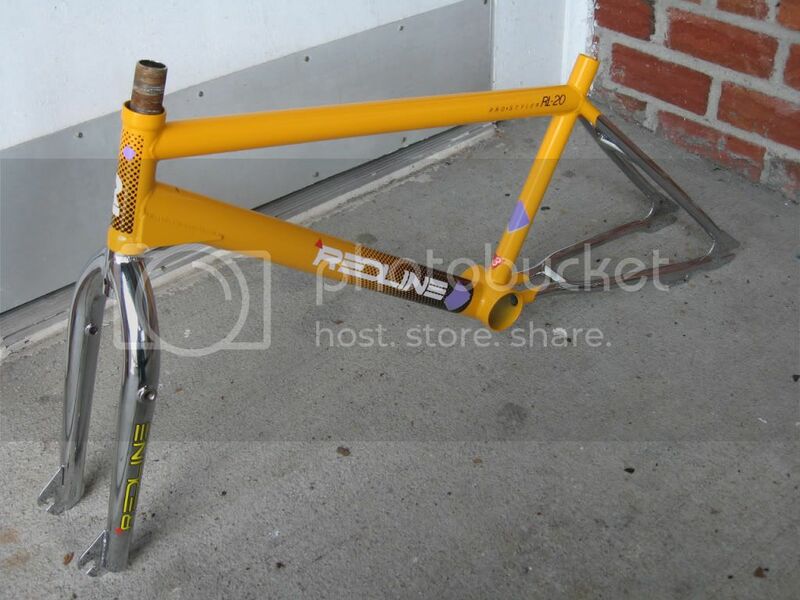 I think this is alot of peoples Holy Grail.Definetely one of the sweetest twin top tubes around. Keep us updated with the build. :Dyeah, now comes the fun of hunting parts and watching my wallet get thin. The '88 is my favorite year for RL-20ii's for one reason...the 990 posts. The only bad thing is that the painted models lost the chrome rear end, but with the all-chrome f/f you have, it's the best of both worlds. Very nice, looking forward to seeing this built up. I agree with the 990 mounts, but there is something about an 85 that I love, But most definatley the chrome must be there with the paint. I am deciding on two paint schemes right now. Either a metallic Radberry w/ metallic black bottom bracket or Toyota Indigo Ink(blue) w/ black bottom bracket, sort of 86 style but more cutom colors. 2/2/09 just giving an update. Just shipped frame and bars to Chip at C4 for powder! All parts have been ordered ( mostly from members) so as soon as I get it back from C4 the build is on, although the stem is coming from a member in Malaysia (so about 3 weeks for that) I am building it the way I wanted it B.I.T.D. What kind of bars and stem are you going to use?? And what color stickers are you going with? Can't wait to see it finished. I have an ACS 45 stem and my Forklifters are at Chips also getting powdered.The decals are 86' from AJK for the turquoise color, white Peregrine Masters, white dominator seat purple mushrooms, I have everything I am just waiting on my frame and bars to get back and then I can go into assembly mode. 2/24/09 just got my bars and frame back from Chip! They look awesome and I start assembly tonight! All done with the exception of the freewheel, and a brake cable housing( both are on the way)! Great looking build! This is how the 88 RL20II should have looked with the chrome rear. Just a little detail, but I love what you did with the number plate. Did you make the plate yourself? Yeah, The number plate was handmade by myself, I have a little to do with it still. And yeah Redline should have left the chrome rear, some of the colors that they did have for 88 would have looked sick with the chrome rear. looks awesome I have been playing around with the idea of sending my 88 to chip to have it chromed and powdered in hazard yellow,If you dont mind what did chip charge for it? Chip charged 250.00 for frame with black bottom bracket and bars. That included shipping back. I think I spent 25.00 to ship to him. no, my frame was chrome to begin with. Sorry not much help with that one. Jim, Here's an 85 RL20 that Chip powdered in Hazard Yellow for me. He charges $200 for the powder and the chrome is extra. The chrome rear section and forks is about $300 and the powder is $200. Chip specializes in BMX bikes and will make sure the seat tube and bearing cups all fit as well as pay attention to the welds and serial number. It's a bit more but worth it. He also has the Hazard Yellow color. the weekend is here and the weather is good. 24 years of waiting to ride my own RL-20II is almost a reality. Saturday morning you know what I'll be doing! that's cool. nice job!! my 88 is simular but black and chrome. That sounds like fun! Let us know how it rides. AWESOME! Bike rides amazing. It was worth the wait. One boneheaded thing I didn't think of were black pads on white mags. ACS pro rotor is so much better than the standard rotor. First bar spin though and the sticker got thrashed on the outside of the rotor due to not bending the upper cable. Glad to hear you had fun! The problem with riding these bikes is that paint and stickers tend to get messed up a bit but it's worth it to enjoy the riding.